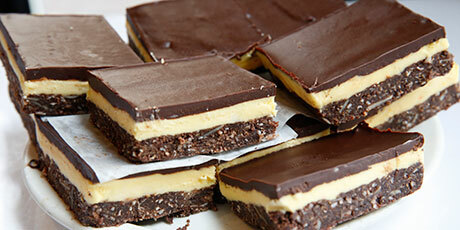 This iconic Canadian dessert recipe comes straight from the heart of Nanaimo, B.C. – from the annals of the one-and-only Nanaimo Museum! Courtesy of Joyce Hardcastle, Nanaimo, B.C. Scroll down to watch how to make this recipe. 1. Pour 2 cups (500 mL) water into bottom of double boiler. Place on stove over medium heat and bring water to simmer. 2. In top of double boiler; combine butter, cocoa and sugar; place over simmering water. Heat, stirring, until butter has melted and mixture is smooth. 3. Add beaten egg; stir until thick. Remove top of double boiler from heat. Stir in graham wafer crumbs, coconut and almonds. 4. Scrape into parchment paper-lined 8-inch (2 L) square baking dish. Press firmly to create even bottom layer. 5. Tip: If you don’t have a double boiler, half-fill a saucepan with water and heat over medium heat until water begins to simmer. Then, place a metal or glass bowl over the simmering water and proceed as directed. 1. In bowl, cream together butter, cream and custard powder. Gradually add icing sugar; beat until light and fluffy. Scrape over bottom layer, smoothing top with spatula or palette knife. 1. In clean double boiler, melt chocolate and butter together. Remove from heat; let cool slightly. When cool, but still liquid, pour over custard layer. 2. Cover and refrigerate until cold.